Start time: August 18, 2014. Ends on: August 22, 2014. Recent years have seen remarkable advances in our ability to compute on-shell scattering amplitudes in quantum field theories. These basic objects are crucial to our ability to provide the theoretical support needed for the experimental program at CERN’s Large Hadron Collider. They are also objects worthy of study in their own right, and investigations into them have revealed new and unexpected aspects of gauge and gravity theories. 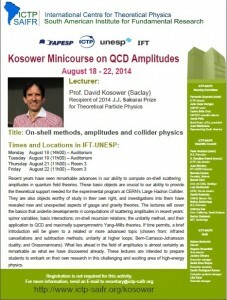 The lectures will cover the basics that underlie developments in computations of scattering amplitudes in recent years: spinor variables; basic interactions; on-shell recursion relations; the unitarity method, and their application to QCD and maximally supersymmetric Yang–Mills theories. If time permits, a brief introduction will be given to a related or more advanced topic (chosen from: infrared cancellations and subtraction methods; unitarity at higher loops; Bern-Carrasco-Johansson duality; and Grassmannians). What lies ahead in the field of amplitudes is almost certainly as remarkable as what we have discovered already. These lectures are intended to prepare students to embark on their own research in this challenging and exciting area of high-energy physics.